Fig. 1: Membership certificate of Seabury Champlin, designed and engraved by Abraham Godwin (1763–1835), 1786, this printing, 1790. Engraving with watercolor and wax on laid paper, 8-1/2 x 11-1/2 inches. Winterthur Museum, bequest of Henry Francis du Pont (1958.1797). Thirteen artisans gathered in New York on November 17, 1785, to establish the General Society of Mechanics & Tradesmen, a craftsmen’s mutual aid organization intended to assist brethren in need and promote the significance of manufacturing to the local economy. Less than a year later, when the group’s ranks had swelled three-fold, providing confidence and security for the society’s sense of purpose, a committee was formed to commission a membership certificate suitable to its mission. An early printing of this document survives in the Winterthur collection (Fig. 1) as a testament to the ambitious and civic-minded tradesmen who established the association. Godwin’s talent for the trade is confirmed by his certificate for the city’s fire department (1787) and illustrations for Reverend John Brown’s The Self-Interpreting Bible (1792), among other projects. But Dunlap’s assertion is likely an exaggeration, for Billings’ skills were also in demand, as evidenced by his contract to engrave new seals for the city of New York in 1784 as well as bookplates ordered by members of the prominent Varick and Van Rensselaer families. The careers of Billings and Godwin testify, however, to the scant documentation for the interaction of New York silversmiths, engravers, and printmakers in this period. The society granted Godwin the commission on August 2, 1786, after his more illustrious contemporary Peter R. Maverick (1755–1811) submitted a bid of twice the cost of his competitor. With economy on their mind, the committee selected the candidate able to engrave the plate “better & cheaper.”2 Godwin charged eleven guineas for this work, and the printed certificates went into circulation the following year. 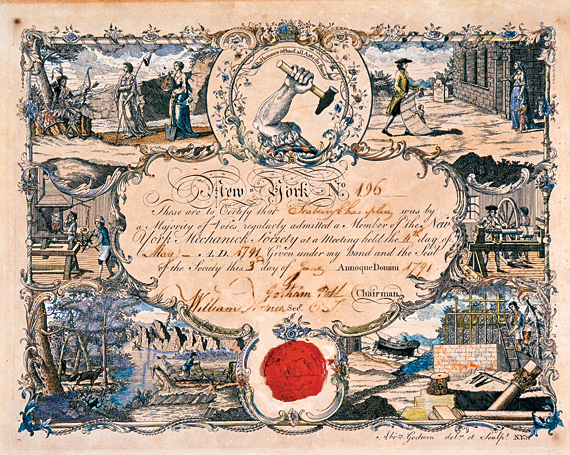 Winterthur’s example, awarded to member number 196, cabinetmaker Seabury Champlin, on June 3, 1791, represents the second printing of the certificate, ordered as the society’s membership continued to expand rapidly. The following year, Champlin and fellow furniture maker Isaac Nichols nominated Duncan Phyfe for admission, the earliest documentation of Phyfe’s presence in New York City. Godwin’s design incorporates an effusive framework centered on the group’s iconic motto, “By Hammer & Hand, all Arts do stand,” and symbol, the upraised arm with hammer. It places a rich tableau of vignettes associated with the society’s aims against the prospects of the new nation. The illustrations of Liberty and Industry approaching America in the guise of the Indian princess at top left and an artisan offering financial support to a craftsman’s widow and children at the at top right (Fig. 2) set the stage for its sense of purpose and goals. A beaver felling a tree and a farmer plowing raw land at bottom left connote the expansion made possible by the efforts of the hard-working artisans who populate the remainder of the certificate, including the turner, blacksmith, housewright, and shipwright. While the crossed square with set of compasses and columns with carved capitals at lower right are common Masonic symbols, and some of the society’s brethren were no doubt Masons, the two groups had no formal association. This mimicking notwithstanding, the significance of Godwin’s work lies in his ability to reclassify such elements in a document that signified the momentous role of the mechanic in a newly independent America, while also promoting the efforts of a mutual aid association, which continues to operate more than two hundred years later. Matthew A. Thurlow is the major gifts officer at Winterthur Museum, Garden & Library, Winterthur, Del. 1. William Dunlap, History of the Rise and Progress of the Arts of Design in the United States (New York: George P. Scott, 1834), 158. 2. Minutes, vol. 1, p. 14, Archives of the General Society of Mechanics & Tradesmen, New York, New York. 3. Minutes of the GSM&T, vol. 1, p. 24. Godwin earned in excess of £23 for engraving the certificate and sinking the seal. 4. Wendy Shadwell, “Commercial and Job Printing Serving the Maritime Industries,” in American Maritime Prints, Elton W. Hall, ed. (New Bedford, MA: Old Dartmouth Historical Society, 1985), 101–102.